Soon it’s the weekend! A collective sigh of relief falls over the Swedish population, at least those who are not forced to work Saturdays and Sundays of course. A weekend means relaxation and family time. It means late nights and parties. It means sports activities with the kids. It means sleeps-in and late breakfasts. It means cultural activities. It means computer game or TV series marathons. It means sledging and skating, drinking hot rose-hip soup. Weekends mean so many different things to different people. ‘Fredagsmys’ loosely translated as ‘Friday Cosying’, is a modern ritual in Sweden. It is when friends and families gather together to mark the end of the working week and get ready for the approaching week. Traditions are different depending on if children are involved but one common denominator seems to be that food is easy and quick to make. Friday night is a big taco and pizza night in other words. Gathering around food for cosy family evenings has a long tradition in Sweden. In the 1800’s and 1900’s something called ‘Söndagsfrid’ (Sunday peace) was popular. Then in the 1970’s ‘kvällsgott’ (Evening Goodies) became a concept. 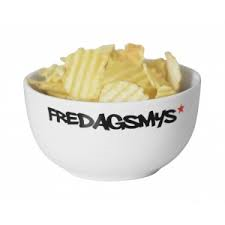 The concept ‘fredagsmys’ became popularised in a high-profile advertising campaign for crisps. With the perky slogan ”Now it’s the end of the week, it’s time for Friday cosying”, (really, it’s perky in Swedish), they captured the Swedish market and encouraged the consumer to devour potato chips on Friday nights. So how does your Friday night look? What kind of cosying are you planning?